Shortly after the 1996 presidential election, University of Kansas (KU) Chancellor Robert Hemenway approached Senator Dole with a proposal that he entrust his congressional papers, accrued over 35 years of public service, to KU — the university he attended before military service in WWII interrupted his studies. 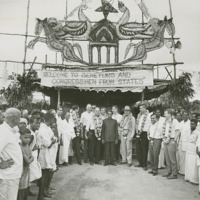 The University was eager to build upon the research potential of this collection and create an institute that would offer opportunities for the public and for students of all ages and all backgrounds — from KU and across the nation — to discover how they might best serve their communities, their states, and the nation. Senator Dole immediately agreed, but insisted that he wanted no personal monument. Rather, he favored creation of a non-partisan forum, dedicated to public service, training for leadership, and promoting the ideal that politics is an honorable profession. It was from these discussions that the Robert J. Dole Institute of Politics was conceived. Dole deposited his papers with the University of Kansas in May 2000 and transferred title to the university in 2001. 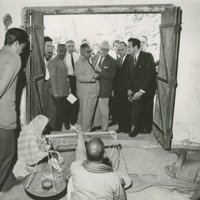 The papers were housed at the Spencer Research Library until the Dole Institute was completed in 2003, at which point they were transferred to the newly constructed building, and the Robert J. Dole Archive and Special Collections was born. 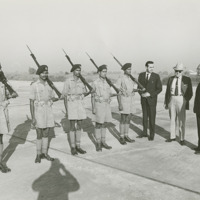 Members of the Congressional Delegation at Purnea Airport where they inspected the Bihar State Armed Constabulary guard of honor. 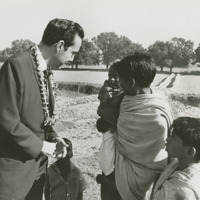 Children crowding around Congressman Robert J. Dole were given pieces of candy by the friendly Kansas legislator. 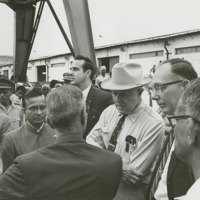 Members of the Congressional Delegation during a briefing at the Port of Madras, one of the principal unloading points for grain and fertilizer shipments from the United States.